“Dance for Another Day” is an annual charity dance performance showcasing the talents of professional, semi-pro and student dancers from all over the San Francisco Bay Area. Since our inaugural production in 2008, DFAD has raised nearly $20,000 for the ALR and featured hundreds of diverse dancers of many levels and styles. To date, we remain one of the only charitable events in the Bay Area to offer this unique, open performance venue. 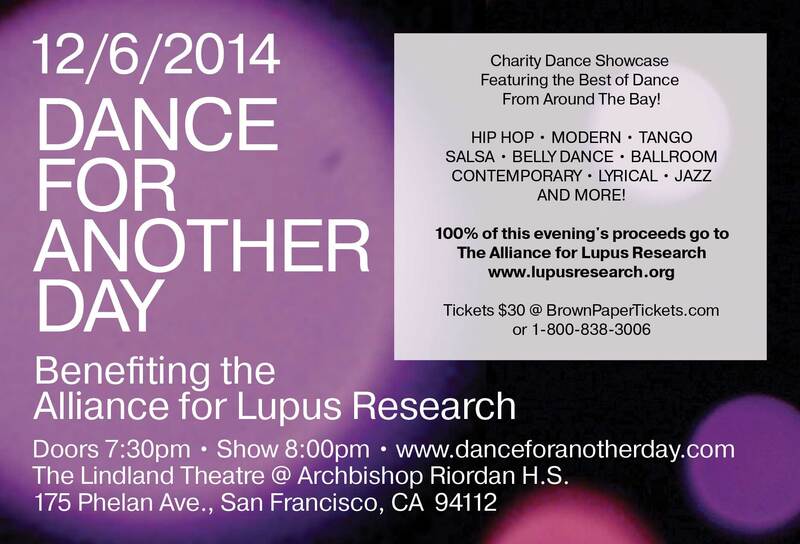 100% of the evening’s proceeds are donated to the Alliance for Lupus Research. We are a completely not-for-profit production and the entire event from start to finish is only possible thanks to the generosity of our dancers, volunteers, audiences, families and friends. "Dance for Another Day" is more than a show. We are a community joined by our love of dance, dedicated to our cause. Our Mission: Lupus affects more than one million Americans, and many more go undiagnosed because the symptoms of lupus often mimic those of other conditions. There is no cure, and the current treatments (including long-term steroid use and aggressive chemotherapy) are often as devastating – and even as deadly – as the disease itself. The ALR is working to change this. We want to help, and we hope you’ll join us in making the next event our best yet. Can't make it to the show? You can still make a difference! For just $1, your tax-deductible donation lends strength to the fight against lupus. Together we can make a difference...together we will find a cure!